The stole must be worn by Bishops, Priests and Deacons when they administer any sacrament or exercise their order during any liturgical function. This attractive stole of lined and interlined texturized Fortrel Polyester is embroidered with the symbols of the cross and IHS (Jesus Saviour of humanity) piercing the Eucharistic wheat and Cup of salvation. 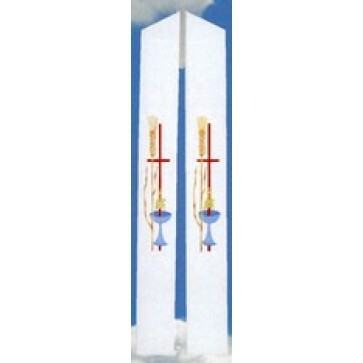 Each design is available in all liturgical colors: white, red, green, purple, blue and rose. Please call with instructions to personalize your gift with a memorial label which can be sewn in.